STEAM-A-THON 2019 is on March 23rd! Register now to secure your spot! 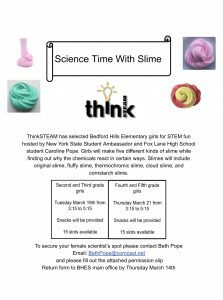 New York Student Ambassador Caroline Pope’s First Workshop, Science Time with Slime, was held on March 18th and 21st! 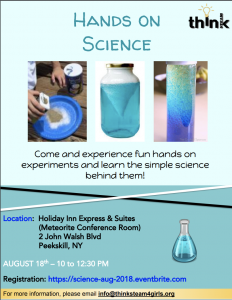 Hands On Science workshop for Elementary School Girls at Holiday Inn Express Peekskill on August 11th! June 28th – Tours of Amazon’s Office in Seattle, WA! 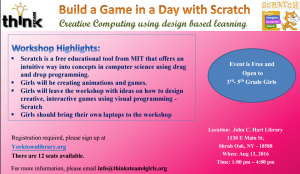 MAY 19th – Workshop for Middle School Girls at IBM’s T.J.Watson Research Headquarters! 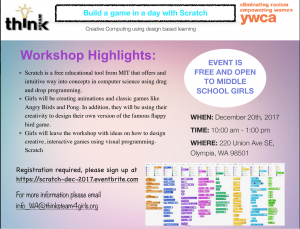 Build a Mobile App using App Inventor at Tumwater Library in Olympia Washington for Middle School Girls! 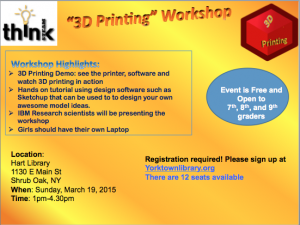 Paper Circuits workshop with Ben Franklin’s Girl Scout Troop on May 31st! 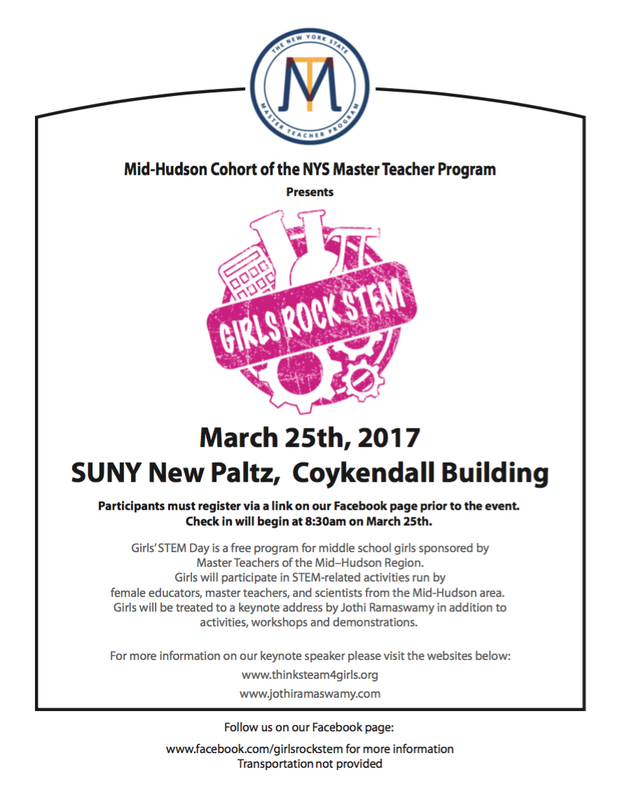 Paper Circuits workshop at Barnes and Noble on March 25th at 6pm for 4th-6th grade girls in New York. ThinkSTEAM Arizona: “Workshop Visit to SynCardia – A Leader in the Total Artificial Heart” on February 19th! 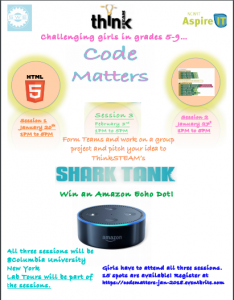 Code Matters: A three workshop series on Jan 20th, 27th, and Feb 3rd teaching girls about how to use HTML/CSS and App Inventor to create a platform raising awareness of an issue they are passionate about. Girls will be challenged to pitch their idea to a panel of women to win an Amazon Echo Dot. January 6th – All day STEAM-A-THON at Lakeland Copper Beech Middle School for Middle School Girls in grades 6-8! Our STEAM-A-THON is a STEM event for middle school girls sponsored by HERlead and hosted by Lakeland Central School District in partnership with ThinkSTEAM. Girls will participate in various hands on workshops in science, engineering, technology, etc conducted by professionals. Girls will receive Free Lunch, a T-Shirt and Swag! iPads will be provided during the workshop. Save The Date: Synthetic Biology Workshop in partnership with Columbia University’s iGEM Team on August 20th! App Inventor Workshop in partnership with Accenture at Accenture NYC on Aug 4th! 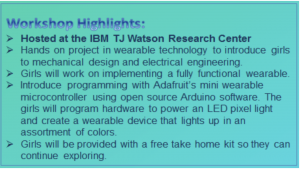 Workshop in partnership with IBM and SWE at the TJ Watson Research Center has been moved to JUNE 17th! Paper Circuits Workshop for Girls Scouts at George Washington Elementary School on February 24th! We will be holding a workshop on paper circuits for girls in grades 3-7 in Barnes & Noble from 2-4 on December 11th. Click below to Register! This is also a fundraiser event. A portion of any purchases you make at Barnes and Noble on Dec 11th will benefit ThinkSTEAM! 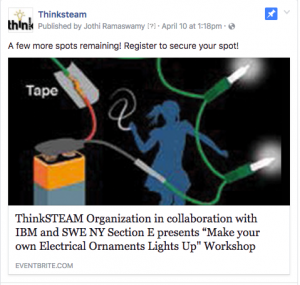 ThinkSTEAM will be partnering with Columbia University SWE to hold a workshop for middle school girls on November 12th from 1 – 4 pm. Register soon to secure your spot! ThinkSTEAM girls will be participating in the Mini Maker Faire at Barnes & Noble in Cortlandt Manor on Sunday, Nov 6th from 3 PM to 6:30 PM. They will be doing demonstrations and showcasing their science projects. 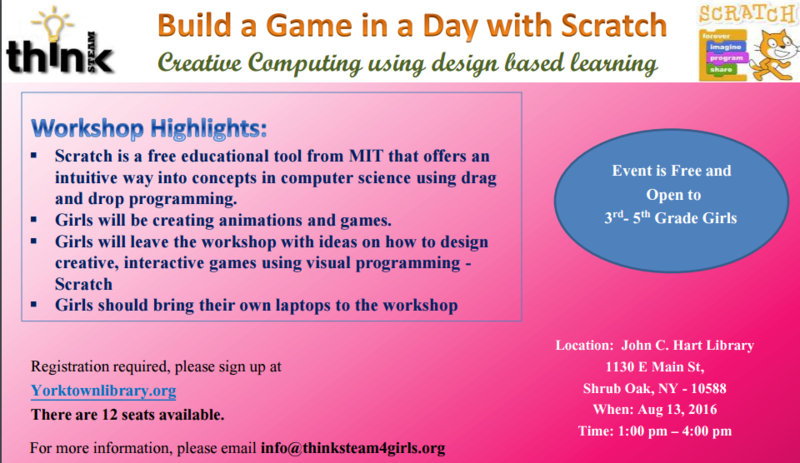 Build a Game in a Day Using Scratch: ThinkSTEAM’s first workshop for elementary school girls in Blaine, MN! 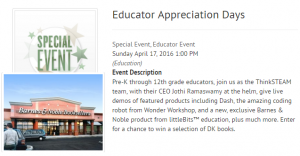 Join us on April 17th at Barnes and Noble in Cortlandt Manor, NY to learn about DASH, the amazing coding robot from Wonder Workshop. Once you register for this event please complete the student release forms to secure your spot. Once you register for this event please complete the online student profile, general liability release, and media release forms to secure your spot. Once you register for this event please complete the online student profile, pre-workshop survey, and media release forms.